Heat equal amounts orange juice and apple cider just to boiling over low heat; pour into mugs. Stir in rum to taste (about 2 teaspoons per mug). Garnish with orange peel. Heat oven to 400°. Beat egg yolks, Worcestershire sauce and red pepper. Stir in cheese. Beat egg whites until stiff peaks form. 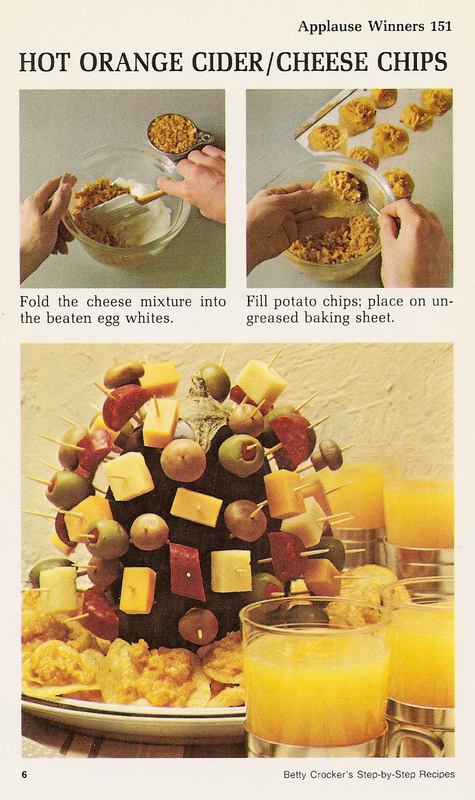 Fold cheese mixture into egg whites; fold crushed potato chips into cheese-egg white mixture. Drop filling by teaspoonfuls onto whole potato chips. Place on ungreased baking sheet. Bake until filling is puffed and brown, 5 to 6 minutes. Serve with eggplant centerpiece as pictures. About 30 appetizers. LOVE the sputnik-style appetizer display in the background. Classic!